Pigmented lesions known as dark spots are remarkably common and the overwhelming majority are benign. It is widely recognized in the medical community that Q-Switched lasers are the ideal tools for effectively removing benign pigmented lesions. Multi-wavelength, IPL, Q-Switched laser systems with frequency-doubled KTP are uniquely able to produce very short pulses of intense light that are selectively absorbed by treatment-specific pigments in a lesion. What is Laser Removal of Dark Spots? 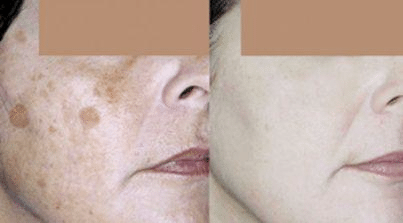 Lasers are a simple, fast, effective and safe tool for removing a wide variety of benign pigmented lesions, such as freckles, age spots, birthmarks, moles, nevus of ota, ephelides, melasma, seborrheic and actinic keratoses. 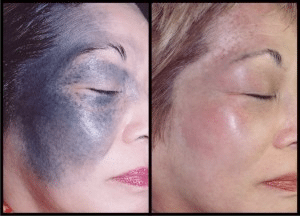 The laser produces short nanosecond pulses of intense light that pass harmlessly through the top layers of the skin to be selectively absorbed by the melanin pigment in the lesion. The laser light is transformed into photoacousticwaves which mechanically break up the melanin pigment into smaller particles. Why is the QX MAX perfect for Laser Removal of Pigmented Lesions? It is widely recognized in the medical community that Q-Switched lasers are the ideal tool for effectively removing benign pigmented lesions. Combining 4 laser modalities in an advanced, high-powered solution, Fotona’s QX MAX laser system effectively removes all common pigmented lesions. Laser treatment of pigmented lesions is quick, sutureless, has a rapid healing time and produces excellent results. It is suitable for all ethnic skin types. For example, Asian skin is highly sensitive to heat and often hyper-pigmentation can result from using the wrong laser sources or as a result of poor administration of the laser treatment. The Nd:YAG or KTP Nd:YAG laser sources, on the other hand, have been generating desirable treatment results to all ethnic skin types.